Becky is a Haleyville native, where she grew up exploring nature and helping her father take care of his beagles. For her, a career spent tending to the needs of animals simply makes sense! Becky gets to help pets daily as a member of the Bell Veterinary Hospital team. Becky began her journey in the veterinary industry more than four years ago, when she started working at a clinic in Indiana. 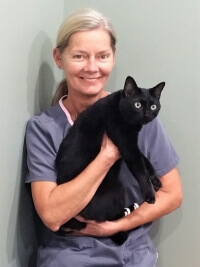 Upon moving back to her hometown of Haleyville, she joined the team here at Bell Veterinary Hospital and has been helping the pets and animal parents of this area ever since. She’s particularly fond of assisting with spay or neuter surgeries, using laser therapy techniques to speed pets’ recoveries and helping animals with skin issues to feel more comfortable.